Tried and true family favorite! Delicious served with salad, garlic bread and tiramisu! This is one of those recipes I posted when I first started blogging. 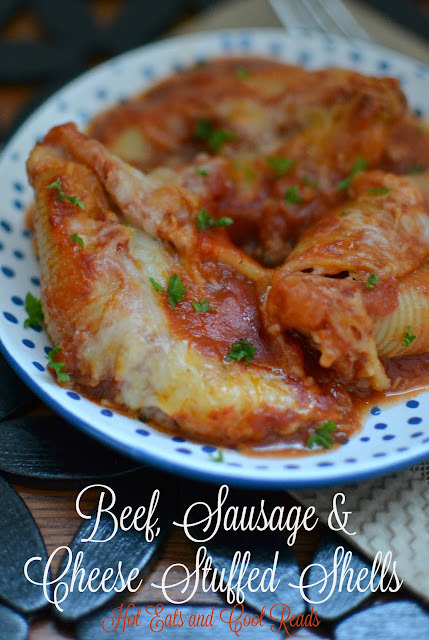 Since it's a favorite of mine, I knew I had to do a new and updated post to share this awesome recipe with everyone again! The original post is here. 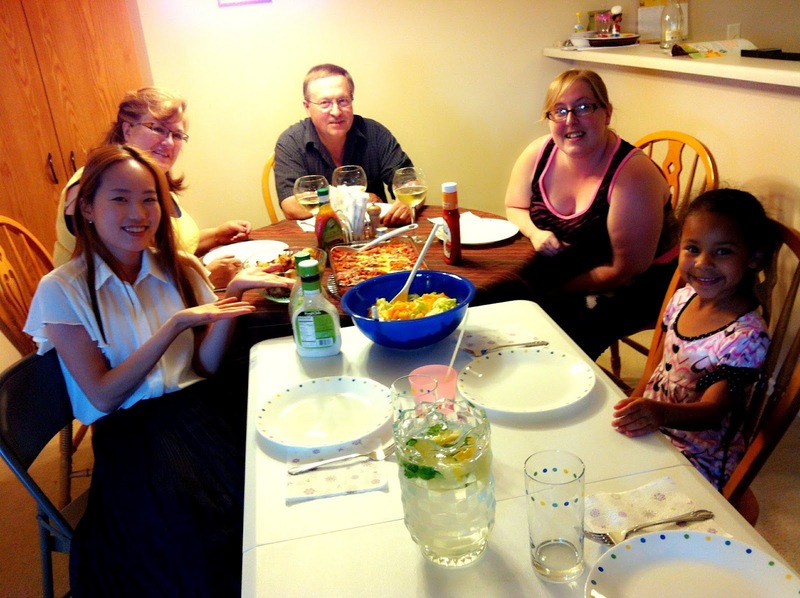 My Step-Mom and Dad had a couple exchange students from Korea staying with them for a week and I was super excited to have them over for dinner! I decided to make this recipe because the flavor is amazing and it serves quite a few people! Everyone loved them and we even had leftovers. We ate salad and Mini Garlic Monkey Breads for the sides. It was a perfect meal and it was so nice to hang out with Nary and Jay, the exchange students, and of course my family! 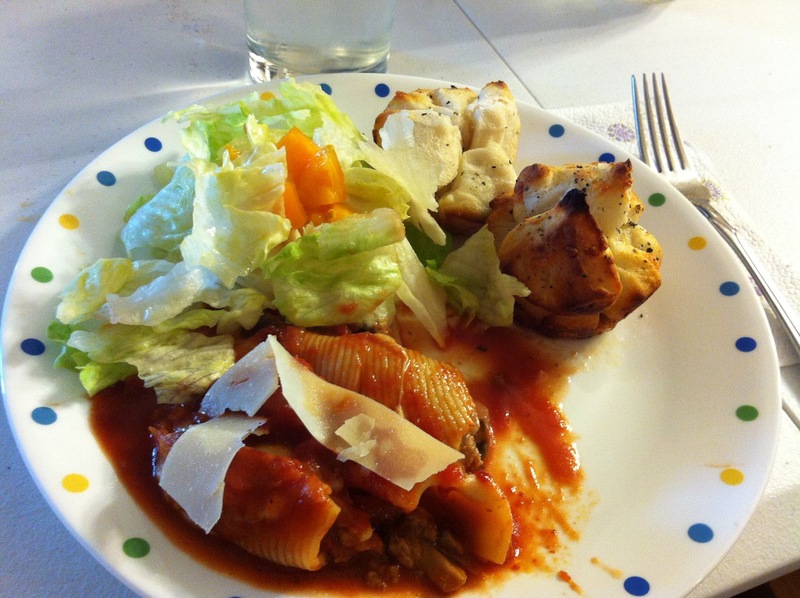 Here is Nary's photo of her plate! Hope you love this recipe as much as we do! In a large skillet, cook onions, garlic, ground beef, sausage, Italian seasoning and mushrooms until meat is browned and onions are tender. Add mozzarella, stir until cheese is melted and remove from heat. Meanwhile in a large saucepan, saute onions and garlic in olive oil for about 10 minutes over medium heat until onions are tender. Reduce heat and add the tomato sauce, diced tomatoes, tomato juice, sugar, salt and pepper. Simmer for 10 minutes. Add one cup of sauce to the ground beef and sausage mixture and stir. Remove from heat. Spread some sauce in the bottoms of a 9x13 and 8x8 inch baking dishes. Stuff each shell by scooping meat and cheese mixture until full. Set in baking dish and repeat. I usually have a few extra shells leftover. Pour remaining sauce over shells and top each dish with shredded Mozzarella. Bake for 35-45 minutes or until cheese is browned and sauce is bubbling. Sprinkle parmesan cheese on top when serving! This looks like a wonderful meal for company! My husband really like Italian food, so this would definitely be a hit at our house :) Pinning it! Thanks for pinning Jamie! This is at the top of my list of favorites! I know it would be a hit with my family! 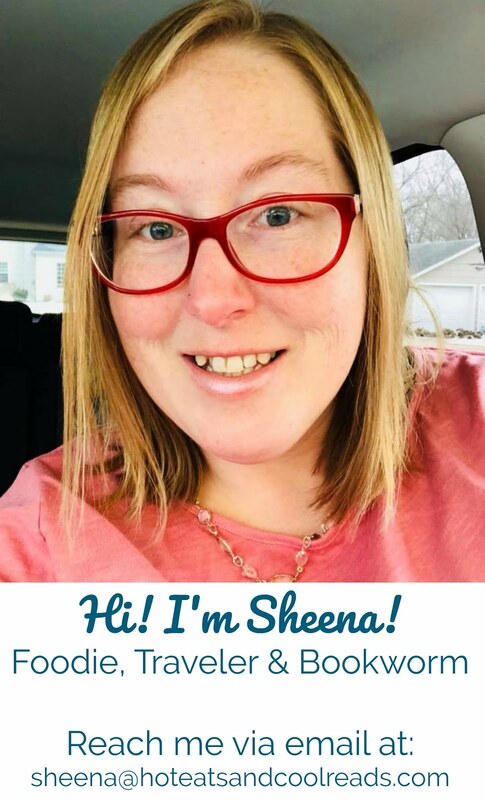 Thank you for sharing at All my Bloggy Friends! Yum! This looks like great comfort food! Thanks Jessica! It's too good!! 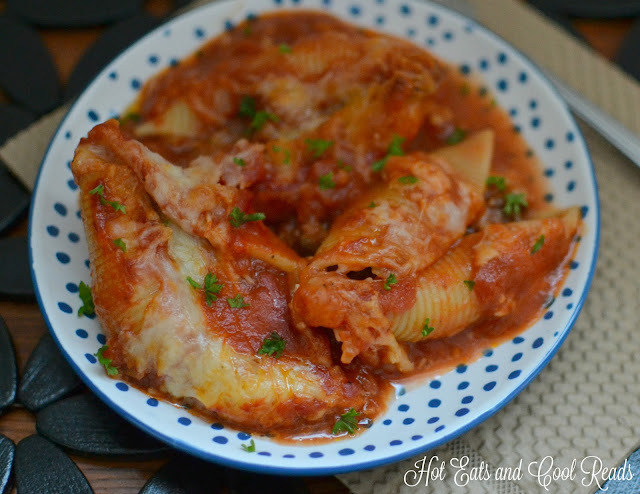 I love stuffed shells and this looks like a great recipe that I will be trying soon. Thanks for sharing on Foodie Friends Friday and remember to come back and vote on Sunday. Thanks Marlys!! Hope you like it! This looks like a great dish to carry us into fall. Your recipe is awesome! Hope you have a great weekend and thanks for sharing with Full Plate Thursday. This looks like a good recipe. Thanks for sharing. I'm going to have to try this. Hope you like it Patricia! It's so good! Thanks for stopping by! Thanks Michelle! This is my all time favorite meal! Thanks for hosting!